Race Takeaway: Running with Rob makes time fly by quickly! 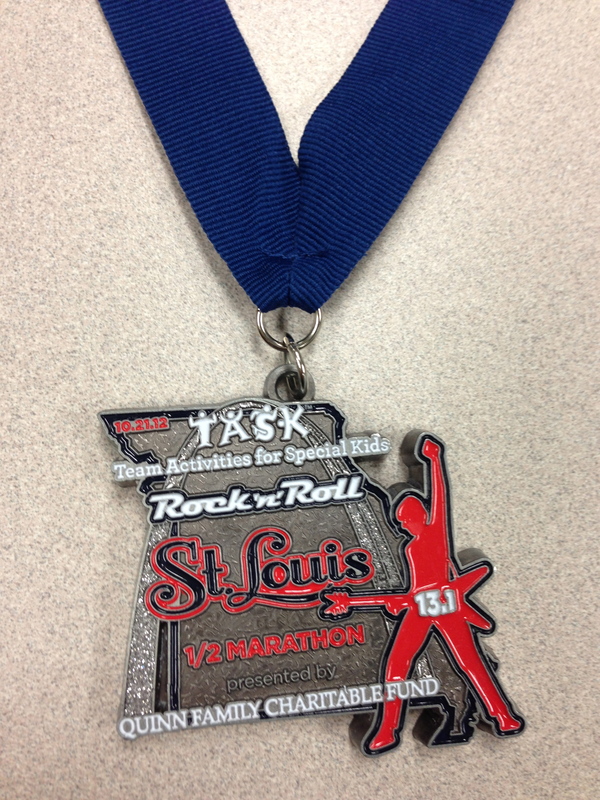 Last weekend we made our way to St. Louis to run the Rock and Roll St. Louis Half Marathon. We met up with Drew and Chrissy for the expo and hung out on Washington Street. 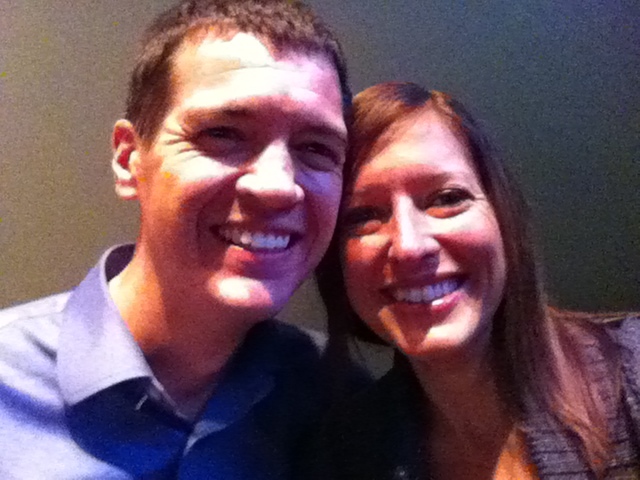 They were interested in sushi for dinner and checked out Wasabi Sushi on Washington. 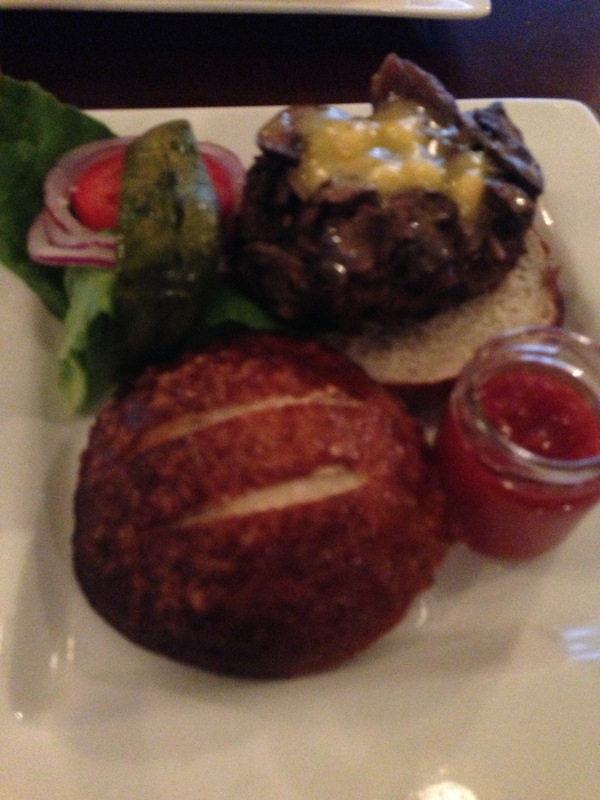 I was more in a burger mood so we checked out Bailey’s Range. It was amazing! All of the meats are grass fed, free range, local and the sauces (ketchups, mustards, etc.) are all homemade in house. 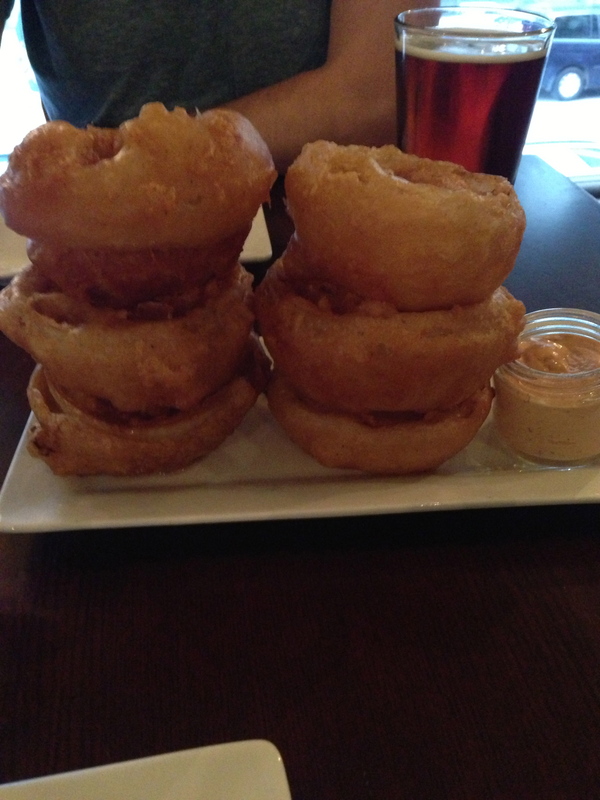 We split the onion rings, these are a must do! 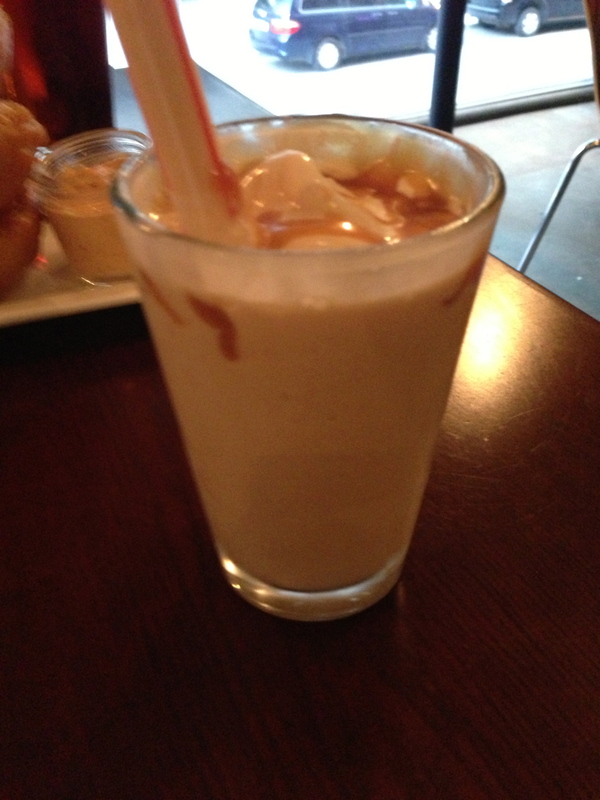 And I enjoyed a small salted carmel shake. OMG it was delicious!!! That’s a good pre-race meal, no? Knowing my past stomach issues this would have been the kiss of death, but being on a probiotic pill (as advised by my doctor) really helps. Plus Rob and I were planning to run this race for fun together. So it wasn’t like I needed to be ‘race ready’ or anything. Sunday morning we were up at 4am and all headed down to the start just after 6am. It was a quick walk from our hotel. The weather started out cold with a brisk breeze and I wished I had brought a throw away shirt. I don’t know why I don’t just pack one for every race just in case because I’m usually cold at race starts year round. The race started 10 minutes late, which can get a bit annoying standing there, freezing, waiting to just get things going. And then we were off. 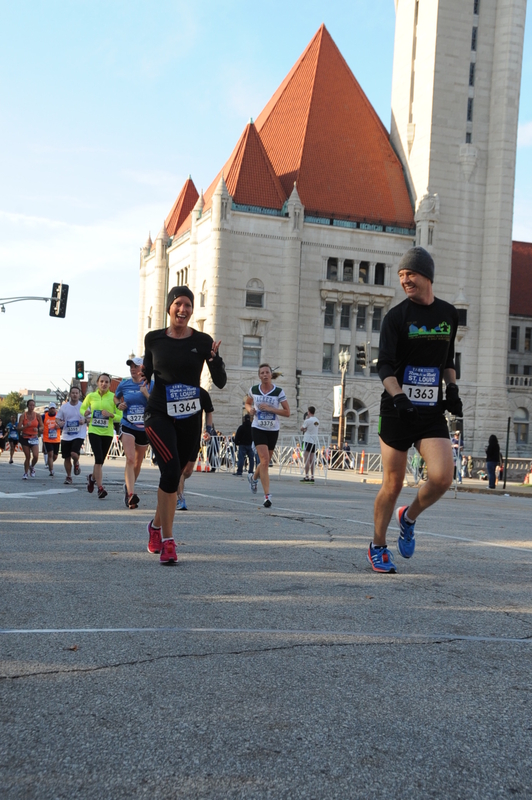 While I liked having a hat, I regretted the gloves by mile 2. Time flew running with Rob. We chatted about buildings we saw, cute doggies with spectators, etc. While the miles clicked by quickly, my right piriformis hated the inclines and hills that are through out this course. My leg was not ready for the race, so I had to really back off the pace and it was just a family run more than a workout. We had a good time smiling for the cameras too. One particular race highlight – I got rapped at! A girl around mile 7 actually starting rapping a beat “you’re running!” and then dropped some beat box sounds. It was crazy! I was like “Did I seriously get rapped at?! She took my mind off the pain in my leg!” Loved it!! 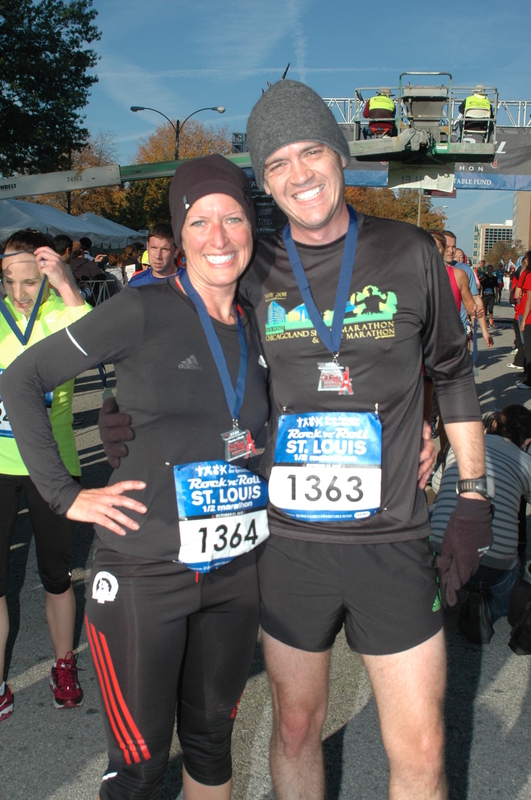 Categories: Half Marathon, Race, Rock and Roll St. Louis Half Marathon, St. Louis, Travel | Permalink. 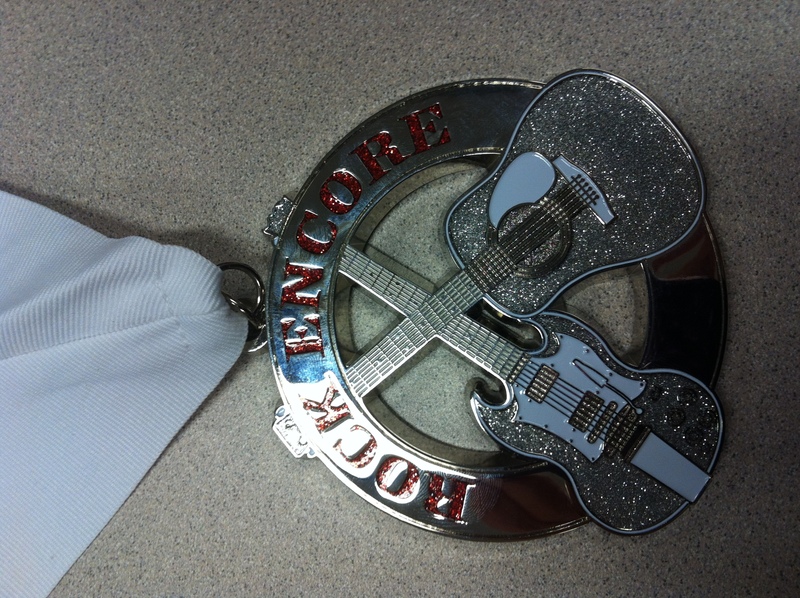 Rob and I received our Rock and Roll end of the year medals for our two half marathons with their series in 2011, the Rock and Roll Chicago and Rock and Roll St. Louis. As badly organized as Rock and Roll Las Vegas sounded, I can say that both of these races were very nicely organized and correctly sized for the course. 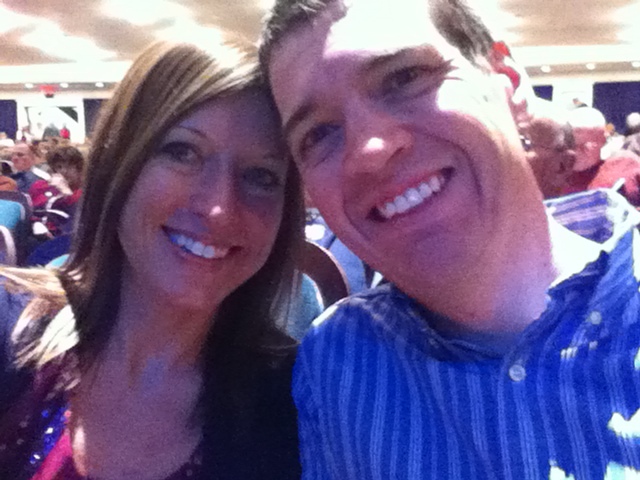 Friday I went with my girl Lisa to Running Central and One World Cafe, both in Peoria, IL. Lisa wanted to try out their gait analysis since she has very high arches and has been having issues with her feet off and on. Look at all that air under her arches, wow! 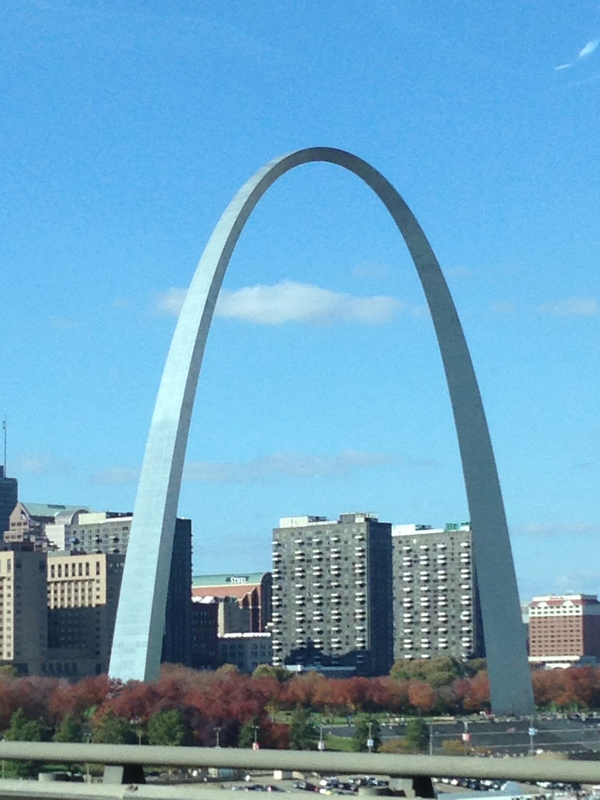 Girl could smuggle diamonds under those arches if she wanted. 🙂 They gave her some model recommendations in Saucony, Mizuno and Newtons and Lisa is going to figure out her next move on purchasing once she is done with physical therapy. I on the other had three gift cards burning a whole in my pocket so I was there to load up on Swiftwick socks for Rob and I. I love that local races have door prizes that include gift cards. It’s the icing on the cake to win a prize just for being at a race. I got 4 pairs of zero ankle Swiftwicks (3 for Rob, 1 for me) AND 1 pair of calf compression for myself all for $17 after gift certificates, score! When I got home from shopping I power napped and then got up and ready for a happy hour that included two spots. I’m not a big drinker so I just stuck to water and a little diet soda at the first location. The second spot I ended up with two super delish dirty martinis with stuffed blue cheese olives, but I also made sure to drink water. We had appetizers as a group, but I clearly didn’t eat enough because those martinis left me worked over the next day. I was so unhappy with myself. Lately it seems that one drink is my limit and I’m going to have to stick to that if I don’t want to feel like total crapola the next day. I wasted most of the morning feeling gross and rehydrating. 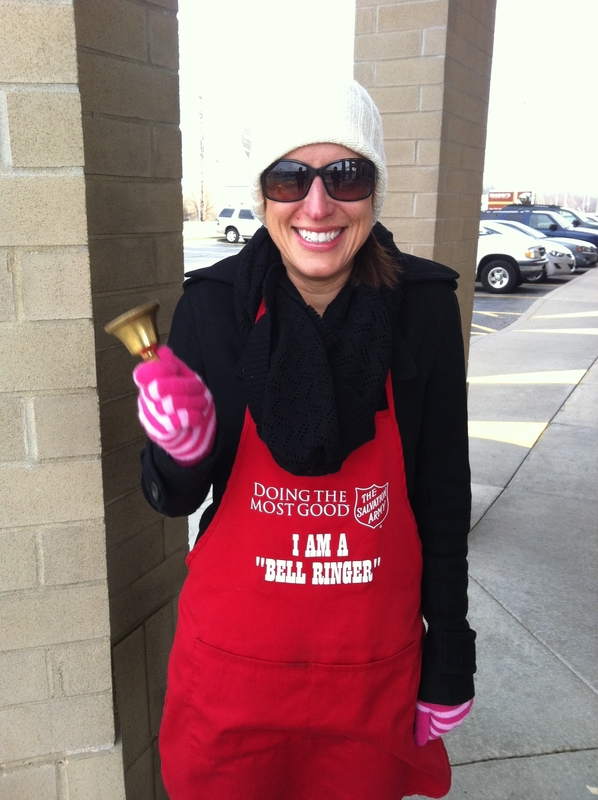 By the afternoon I was able to get going so Rob and I could ring bells for the Salvation Army. It was freezing out the two hours we worked, but we toughed it out knowning that the money helps others who have to deal with being cold and hungry. 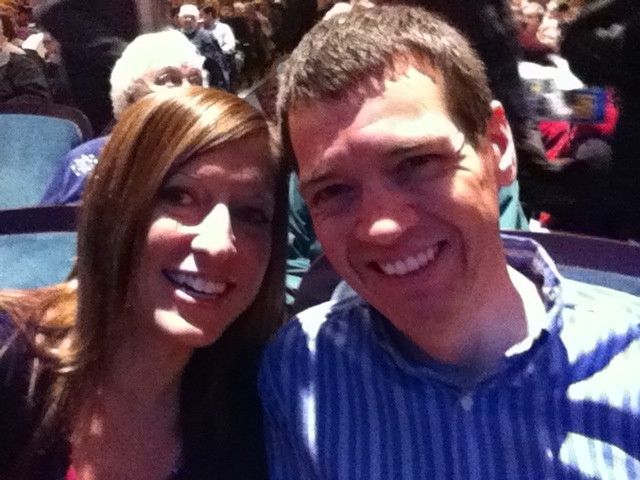 Afterward I got in my 9 Mile run and then we went out to Glenn Miller Orchestra. 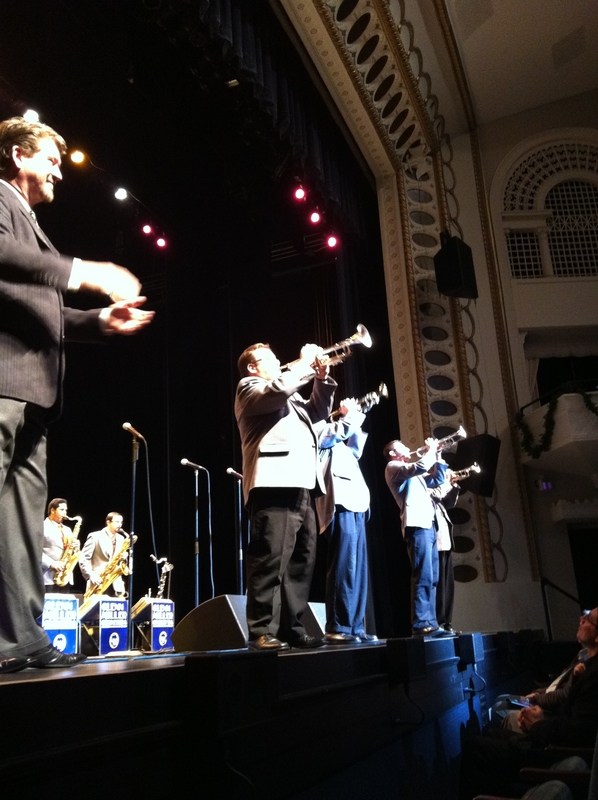 They put on a great show and include old holiday classics. My attempts of trying to take our picture. Afterward we went out for drinks with Chris and Lisa, but I stuck to water since I wasn’t fully recovered. Sunday we finally got to our holiday shopping and decorating, and fit in our long runs. It was nice to feel finally rested and back to normal. 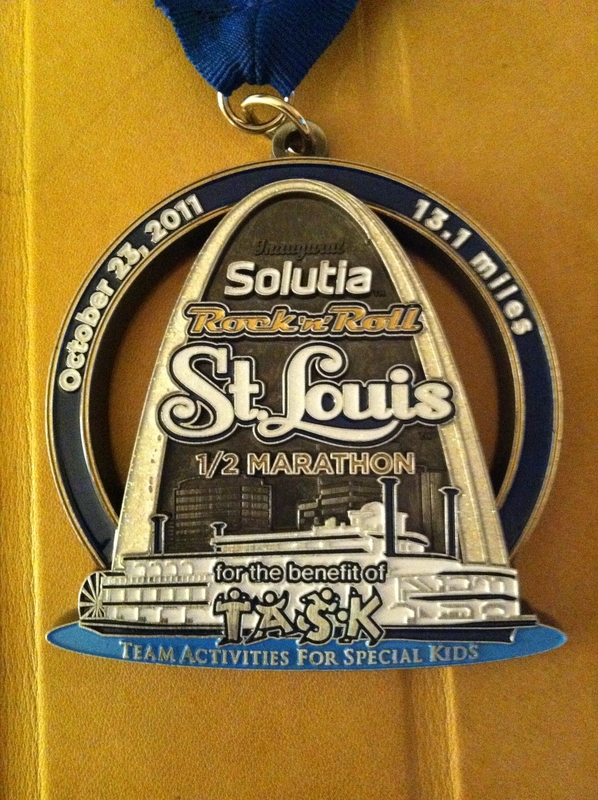 Categories: Award, Concert, Out and About, Rock and Roll Chicago Half Marathon, Rock and Roll St. Louis Half Marathon | Permalink. This race I was on the fence about running from up to the moment we woke up to get ready. As I mentioned in my previous posts, I have been dealing with tight hamstrings, especially on my right side, for about a week before the Chicago Marathon. I ended up having hamstring issues most of the marathon. Since then I’ve been trying to follow the scheduled recovery period as my legs would allow. I was feeling optimistic since I was noticing improvement. Eventually my left side was pain free and just my right hamstring was sore. Friday I was feeling better and went out for my planned 8 miles easy and was going to do pick ups afterward. I found out quickly that I couldn’t even finish 8 easy without foam rolling. How was I going to run a half marathon in two days feeling like this? I iced my leg often Friday. Saturday I even sat on an ice pack on as we drove to St. Louis. I also did an ice bath at the hotel that night. 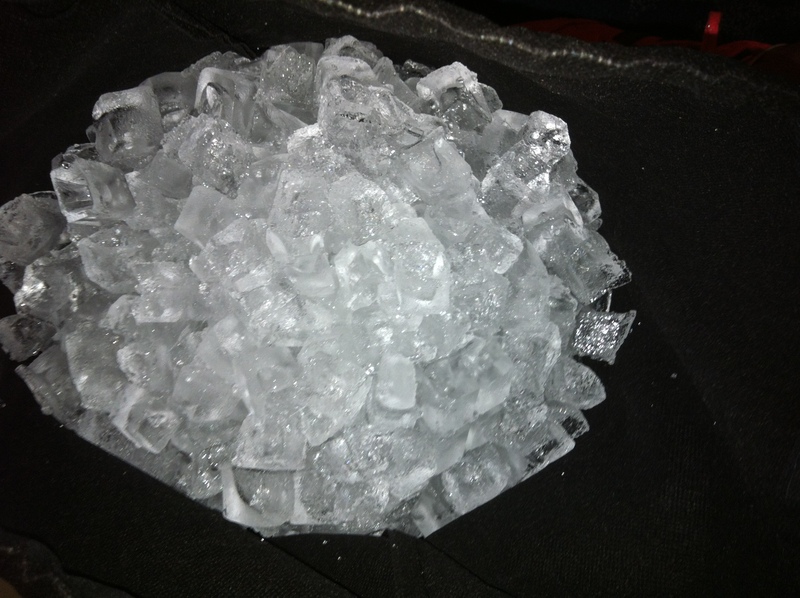 FR Tip: If you are at a hotel and plan to take an ice bath, use the gear check bag as your ice container for the ice machine, it holds a lot! I knew HM goal race pace was out of the question. I was more worried could I make it 13 miles without making my injury worse, especially when 8 easy Friday was such a struggle. I awoke to a leg that was improved, but not 100% I planned to run the race and be conservative with my stride. I knew I could get out there and within a few miles I could be regretting my decision. As far as my tummy goes the day before the race I had gluten-free cereal, salad from Panera with no dressing and a strip steak with cream spinach for dinner. I know it’s TMI but magic happened, thank goodness! So I was happy to expect tummy issues wouldn’t be a concern. 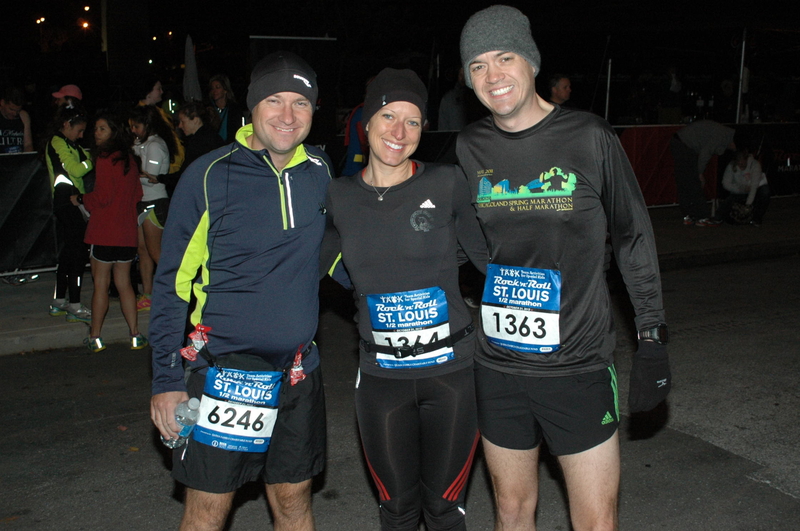 We stayed in a hotel close to the start/finish area so we were able to easily warm up before getting into the corral. Rob and I spent some time determining how much of a stride I could take to try and save my hamstring. I would try to make an effort to take smaller steps and lean forward to keep my hamstring as happy as possible. The weather was perfect! 55 degrees and zero wind, mostly overcast, the sun only came out for short moments. By mile 2 a young lady says to me “Hey didn’t you race Washington?”. I say “no”, thinking of Washington D.C. first and wondering if Rock and Roll has a race. I didn’t catch at the time she meant Washington Cherry Festival in Washington, IL. 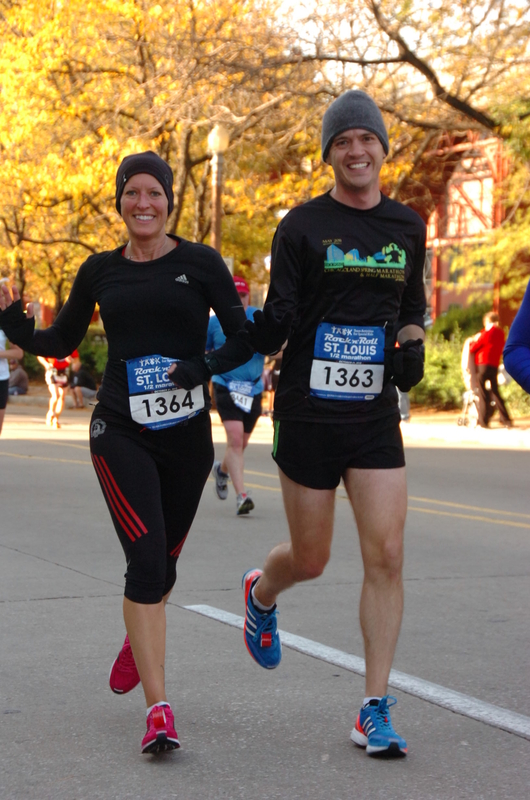 Then she says “but didn’t you run Rock and Roll Chicago and IVS Half Marathon?” Then I’m like “yes, yes I did!” She responds “I thought I’ve seen you at those races, you and your husband race a lot.” No denying my addiction for racing. 🙂 She asks if I ran Chicago Marathon and is suprised to see me out. I tell her about my hamstring and my conservative pace. I try to catch her name and I think it was Vanessa. 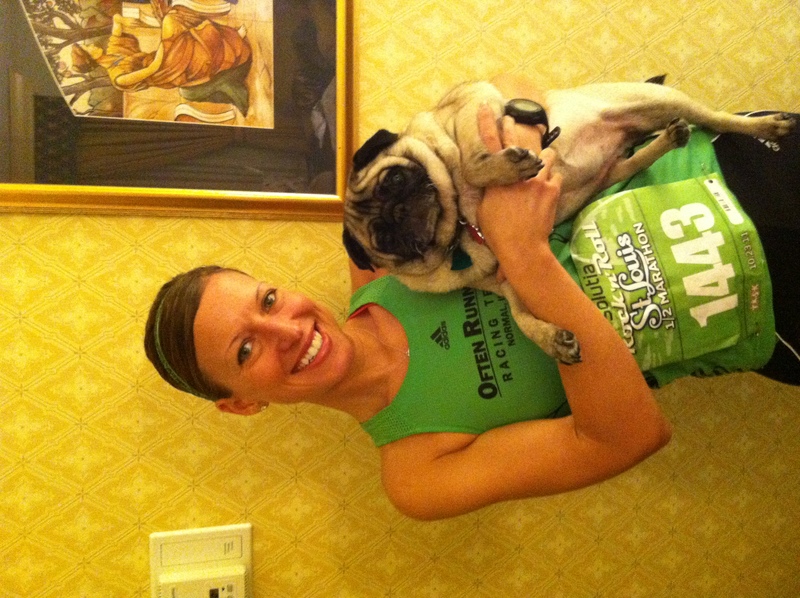 I tell her about the running blog, so if you do read this please post and say hi. I hope you had a great race! The course went south into some beautiful neighborhoods. It was just an absolute perfect day. As we came into the finish it was on an incline which was an interesting, punishing twist. I finished with a 1:43:09, which I’m very happy with considering I wasn’t certain I could even race at all and my leg didn’t feel any worse! I easily found Rob and he also had a fun race, finishing with a 1:32! This was one of the better organized Rock and Roll races. There were a lot of bands throughout the course that sounds really great. The waters were iced and there was plenty of fruit afterward. The medal was large and seriously heavy. Afterward I had another ice bath and am still feeling like things are improving, thank goodness! I would definitely consider coming back to do this race again.